Part autobiography, part diary and part memoir, Head Bangin' Radio recalls the adventures of a journeyman "Rock Jock" whose beginnings on a tiny 10-watt college radio station in Southside Virginia failed to foreshadow his eventual landing at an LA-based heavy metal upstart station in the 1980s. From the overnight weekend airshifts broadcasting to the "night people" of the deep South to standing on stage at the Los Angeles Coliseum in front of 80,000 screaming metal heads, Head Bangin' Radio is a fun and funny look into the real-life experiences of the man the Southern California rock radio audience knows as Thrashpie. If you ever wondered what it was like to be on the radio, or just what the heck those people were really doing "in there" as you listened, you'll find the answers in these pages. Written like a private conversation, with all the blemishesout front, Head Bangin' Radio plucks the heartstrings of those who loved the great era of FM rock radio, and for those who lived for the music and for KNAC-FM. 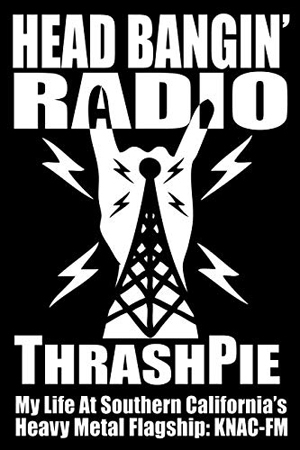 Edmund Bragg (Ted) Prichard, aka Thrashpie, aka Thrasher, aka Rock N Roll Ted, aka Uncle Lee (WTRG-FM), aka the Dream Merchant (WWHS-FM), spent more than 20 years on the air. A member of the Screen Actors Guild-American Federation of Television and Radio Artists since 1986, he produces and performs his two-hour classic heavy metal streaming radio show, "The Pure Rock Metal Storm", which originates from the LA Radio Studio in Los Angeles (LARadioStudio.com). Never one to sit still, he's currently developing a series of children's books, a one-act stage play, screenplays, more Thrashpie Radio podcasts and a docu-series focusing on the Pure Rock years at KNAC-FM in Southern California.